Les Carmes is not only finding a home away from home but also opening the door on a world of services on the first floor of a 19th century lime stone mansion protected by the National Monuments Chart. Entirely renovated in 2012, keeping in mind the historical aspects, the high ceilings with their molding, the plain oak floors, it now offers an elegant and modern comfort opening its 4 large French doors on a leafy square. As you open the entrance door, the main room reminds you of the history of the mansion: Oak floors, moldings and wall trim. This bright & spacious room is facing the square with 2 French doors from which you might catch a glimpse at the slate covered medieval house on the other side between the leaves. The ceiling, over 3 meters (10 Ft) up contributes to the feeling of space and freedom. On your right is the living room area with its convertible sofa and the two Archibald armchairs inviting to some relaxation. Modernity has not been forgotten, with the HD flat screen TV and its 150 channels, the high speed Wi-Fi, and a stereo as well. The house phone is free and unlimited to landlines in over 100 countries. To the right is the entrance of the Littre suite, which opens as well onto the square. From its French door you will have the best view of the lovely front of the “Ecole des Compagnons” followed by the St Saturnin’s decommissioned church, the remains of the former convent and now a part time exhibit place, then the banks of the Loire river. With its 12m² (130 Sq. ft.) it offers the flexibility of a king bed or two large double beds. To complete the suite Littre has its own bathroom equipped with a multi-function shower and a private toilet. To the left, past the dining area, is the Balzac suite, in honor of Honoré de Balzac, a 19th century French writer who was born in the city and kept coming back all his life to find his muse. The 14m² (150 Sq. ft.) bedroom usually considered as the Parental suite has a Queen size bed where you will sleep away the hard work of a tourist's day! By the window is the writer's desk where you will be able to write down your memories unless the Casanova armchair gets more attractive for some reading time. From the bedroom you have a direct access to your private bathroom equipped with a bathtub and toilets. Finally at the back of the living room, facing the dining area is the kitchen. Some people will tell you it's the most important room in a French home! This is probably why we spent some extra time in designing the room during the recent renovations. As a result you will find there all the modern equipment you can expect: Multi-function oven, microwave, fridge, freezer, induction stove, dishwasher, washing machine... Breakfast was not forgotten either with its toaster, coffee maker and electric kettle. In the cabinets you will find all the utensils you may dream of to cook memorable meals. Thanks to its floor plan, Les Carmes is the perfect location for either a family vacation or shared by two couples who can enjoy total privacy from each other but still meet in the living room for a Scrabble game or in the kitchen cooking meals "a la Francaise" thanks to the state of the art appliances with a glass of “Noble Joue”, a local wine, in hand. Passionate about traveling we have long ago realized how important it was to stay at the right place. In 2011 we have created "Etape de Charme" a concept where everything is done for you to enjoy fully your time. Not only we have renovated, furnished and decorated our properties to a level 4 stars but it come with plenty of services so you can feel at home away from home. Les Carmes is one a the little gems well hidden in the historical district. Once you've craked the shell you'll discover true authentic French charm but with modern comfort in a world of small attentions. At Les Carmes you are in the beating heart of the city but still removed from its crowd. As you will discover renting Les Carmes is entering a world a little details that make life enjoyable and vacation a bliss. The Balzac suite is equipped with a bathtub and shower, a towel heater and a large mirror, the toilet is hidden in the alcove. The bathroom in the Littre suite has also been entirely renovated it now offers a multifunction shower, a towel heater and a toilet. A large sink will allow the kids to get ready together. All you need is your personal effects. Les Carmes has it all like your home away from home. Along the streets within 50 meters or in a covered parking within 200 meters. A set of 3 towels per Guest plus a selection of complementary amenities. More than you need to dine in style. The Tv is connected to almost 200 channels including a majority of foreign programs. The Internet connection is a fast wired and WiFi unlimited access. However, we ask you to use it in the respect of the law. Each room has its telephone handset. It is connected to a land line and communication to 150 countries is free. For your stay you can also configure it with your own Skype account and keep in touch with your friends and family! All appliances are green! The cleaning is done before your arrival, however if you wish, a flexible additional cleaning option is available and can be purchased at booking time. All the linen is provided (beds, bath, table and kitchen). Detergents and cleaning products are provided. 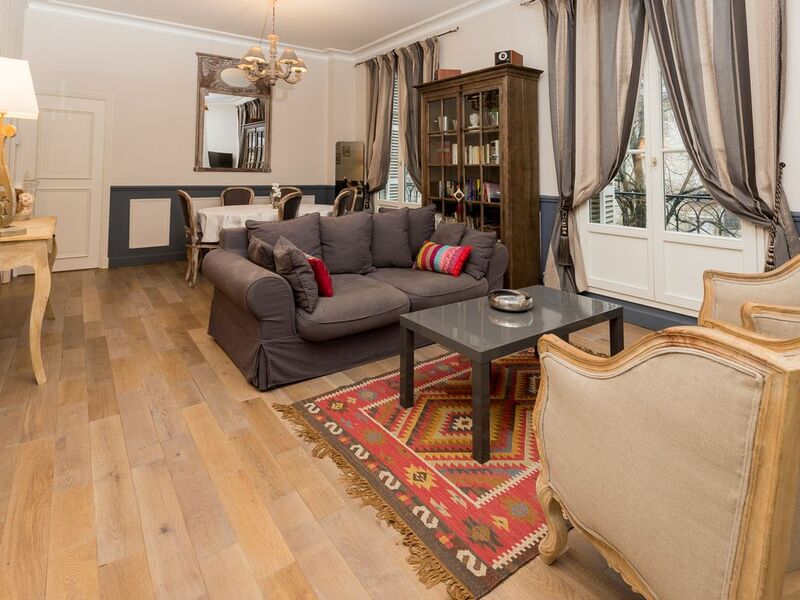 Very conveniently located apartment in Old Tours. Nice walks along the Loire, and among the narrow streets of the old city. Apartment was comfortable and well presented. On eary check-in, we were met by Fabrice and Helene, who showed us around and were very helpful. 5 stars to Helene, who went above and beyond by providing a ride to the train station on our departure! We loved the apartment and its central location. Baths and kitchen have been remodeled and are very nice. We could walk all over town easily from our apartment. The only real drawback was the noise from the university students on Saturday night as they were going to and returning from the central square. We had a rental car but always found a parking spot within walking distance and also used the parkade for longer stays. If you would like to experience what it’s like to live in the old part of a European city this apartment is for you. Despite being in the Old Town, it is large and well fitted out, the kitchen and the two bathrooms appear to have been recently upgraded and have all the mod cons. Parking was also not a problem as there is a huge 24X7 parking station only a short walk away (12 euro/ day). Despite Tours being heavily bombed in WW11, there are still plenty of very old buildings near the apartment to look at. It’s a strange sensation watching the tour groups walk through what you consider to be your part of the town. The city of Tours is ideally located for visiting the various Loire tourist sites as it is an easy drive on good roads to get to most of them. For people watching after returning to Tours from a day out, the famous Place Plumereau is just around the corner form the apartment. The owners were very helpful and friendly. We had a wi-fi issue at the start of our stay and Frederique put in considerable effort in helping to resolve it. Just under an hour away from Paris by TGV train and a tad more from London, Dublin, Porto, and many more, in the middle of the « Garden of France » The Touraine region is a welcoming place well known because the Kings of France built there over 200 Royal Castles since the Renaissance The mild climate all year long is also a reason why the area is the third best wine region in France. More precisely, it’s in the medieval district of Tours almost at the junction of two major rivers, the Loire and the Cher that we welcome you in our vacation rentals. You might be travelling with your family or coming for business, be it a couple of days or weeks, we will find a suitable and memorable housing solution for you . “Look up and admire” is written on a plaque at the beginning of Blanqui street. The streets in Tours are like a history book. From the RomanBaths, to the medieval brick and timber houses, often leaning forward or sideways, then further to the lime stone houses, a regional tradition, each step will take you on a journey at leisure. In the midst of the medieval town, a stone throw away from the lively “Place Plumereau” or the busy “Rue du Commerce” the Carmes square is a secluded area. The square itself is a history lesson: Initially a convent, then a fish market it is now a quiet square tucked away in a leafy shell. The mansion where your self-catering apartment is located is from the 19th century, it is surrounded by another lime stone mansion to the right, now home of the most prestigious craftsmanship school in France (“Les Compagnons du Devoir”), a medieval slate-covered house the North and another 19th century mansion to the left. Once you have crossed the square , it will take you a few steps before you get to the banks of the Loire river. The city has worked hard to make it a pleasant place where it feels good strolling along after a gastronomic meal. In the recent years, a “guinguette” even started entertaining people. Take a book with you, have a drink or just look at people, another favorite activity of French people. The banks are also a start for some of the numerous bike tracks, over 800km in the area. They will take you between nature and history at your pace. By now, you know! Tours and its region of the Loire valley is a place where you will always find something to do regardless of the season. People might rush to the Royal Castles or the wineries but do not miss the hidden treasures. For that you can count on us, we will be more than happy to guide you in this region where we have lived for several decades.